Tesla shares slipped Friday morning, down 0.94%, after CEO Elon Musk revealed a lower-cost Model 3 sedan was ready for order on the company's website. They had gained as much as 2.2% in early action. "Just released lower cost, mid-range Tesla Model 3 & super simple new order page," Musk tweeted Thursday evening. The base price will be $45,000, with vehicles delivered through 2019 eligible for federal and state tax rebates that could drop the cost to as low as $35,000 in California. Musk said the real cost of the sedan would be closer to $31,000 after gas savings. Until Thursday, the company had been offering only more expensive versions of the sedan. The Model 3 Performance has a base price of $64,000, but that didn't include options like the popular Autopilot driver-assist system. "For us, the release of a middle ground Model 3 seems a logical next step," a team of Evercore ISI analysts led by Arndt Ellinghorst wrote in a note sent out to clients on Friday. "However, for the stock, we don't believe this new model will change the entrenched positions of most Tesla followers." Tesla's stock price has plunged more than 30% since its high on August 7, the day Musk tweeted he had "funding secured" to take the electric-car maker private at $420 a share. Musk didn't have funding secured, and he later settled with the Securities and Exchange Commission, which had accused him of misleading the public. As part of the settlement, he agreed to step down as chairman for at least three years and pay a fine of $20 million. But the damage had been done to Tesla shares, which trade near their lowest level since January 2017. Traders will be watching closely to make sure it stays above the $250 area - a key technical level - over the coming days. "The big and unanswered question is, will Tesla be able to achieve and maintain its targeted gross margins for Model 3 as mix deteriorates and average RpUs fall?" the Evercore analysts ask. "Clearly, TSLA believes it can through lower costs and increased scale. Bears, understandably, have doubts. Investors will likely have to wait another 12 months to know conclusively." Brad Buss, Antonio Gracias, Stephen Jurvetson, and Linda Johnson Rice will not be standing for re-election in the upcoming annual meetings of stockholders in 2019 and 2020, the company said https://www.sec.gov/Archives/edgar/data/1318605/000156459019012123/tsla-8k_20190418.htm in a regulatory filing. Tesla said the decision did not result from any disagreement between the company and the directors. Of the four members who would exit the board, Buss and Gracias were part of Tesla's disclosure controls committee, overseeing the implementation of the terms of the consent agreement between Tesla and the SEC. Spaceships are no longer romantically surf the Universe but pragmatically sawing it in pieces. The "entrance ticket" to the solar system costs hundreds of millions. T. Rowe Price, once the second-largest investor in Tesla Inc after Chief Executive Officer Elon Musk, has shed most of its stake in the electric carmaker in a series of transactions over the last two quarters. Funds managed by T. Rowe Price Group Inc owned a 10.12 percent stake in Tesla as of September. It sold roughly half of that stake in the quarter ended December and 92 percent of its remaining stake in the following quarter. 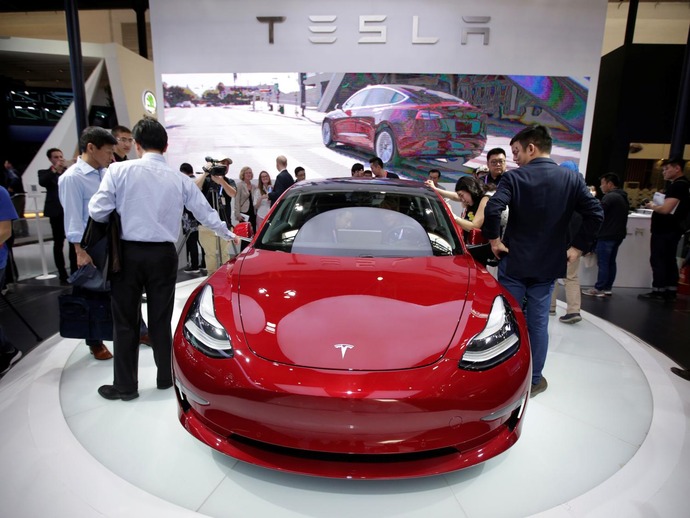 T. Rowe Price funds slashed Tesla Inc holdings in the first quarter, data showed on Wednesday, as the institutional investor continued to cut its positions in the electric vehicle maker. The firm, which has been one of the largest investors in the Silicon Valley company, sold off 92 percent of its prior holdings in the company during the quarter, Refinitiv data showed. That drop represented the funds for which Refinitiv has data, which may not include all T. Rowe Price funds, which are managed by T. Rowe Price Group Inc.